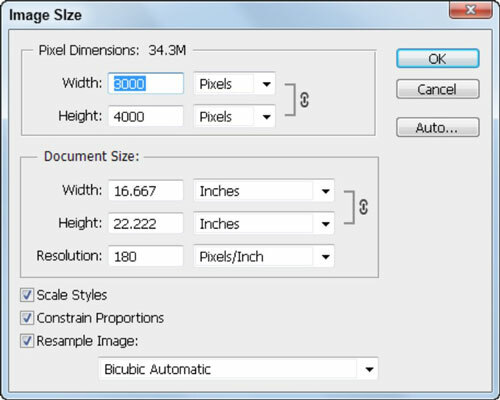 Using the Image Size dialog box is only one way that you can control the resolution in Adobe Photoshop CS6. Even though you can increase the resolution, do so sparingly and avoid it, if you can. The exception to this rule is when you have an image that’s large in dimension size but low in resolution, like those you typically get from a digital camera. You may have a top-of-the-line digital camera that produces 72 dpi images, but at that resolution, the pictures are 28 x 21 inches (or larger)! Deselect the Resample Image check box. This way, Photoshop doesn’t add any pixels. Enter a resolution in the Resolution text field. Photoshop keeps the pixel size (the size of the image onscreen) the same, but the document size (the size of the image when printed) decreases when you enter a higher resolution. If the image isn’t the size you need, select the Resample Image check box and type the size in the Width and Height text fields in the Document Size section. It’s best to reduce the size of a bitmap image, such as a digital photo, rather than increase it. You can also deselect the Resample Image check box and essentially play a game of give-and-take to see what the resolution will be when you enter the intended size of your printed image in the Width and Height text fields in the Document Size area. Images can typically be scaled from 50 to 120 percent before looking jagged. (To scale by a percentage, select Percent from the drop-down lists beside the Width and Height text fields.) Keep these numbers in mind when placing and resizing images in a page layout application such as InDesign. Click OK when you’re finished; double-click the Zoom tool in the Tools panel to see the image at its onscreen size. When the Image Size dialog box appears, make sure that the Resample Image check box is selected. Note that Bicubic is selected in the Method drop-down list. This method is the best, but slowest, way to reinterpret pixels when you resize an image. With this method, Photoshop essentially looks at all pixels and takes a good guess about how the newly created pixels should look, based on surrounding pixels. Enter the resolution you need in the Resolution text field, click OK, and then double-click the Zoom tool to see the image at its actual size.